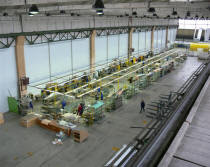 While production of the L-29 Delfin and the L-39 Albatros ceased many years ago, the LET Aircraft Factory in Kunovice, Czech Republic continues to provide aircraft for sale around the world. The companies at this facility use many of the same workers who produced the aircraft you see in the Cold War Air Museum. 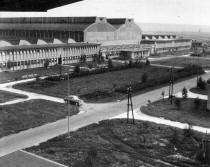 Built at the end of World War II, this solid, massive facility is now home to Czech Air Works (CZAW) the manufacutrer of the Sport Cruiser. Designed as a Light Sport Aircraft, the CZAW Sport Cruiser is an all metal, low wing, two seat craft with a nominal cruising speed of 110kts. and a range of 6 hours. 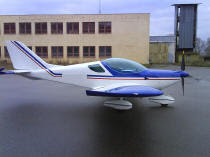 Based on the US Light Sport category, these aircraft meet the needs of this growing segment of the aviation market. Seen here is a Sport Cruiser at the ramp in Kunovice for delivery from the factory. The factory is a mix of old and new. The facility is old, but the equipment and fabrication techniques are new. In talking with some of the workers, it became apparent that they have a wealth of experience and some of them worked on the L-29 during its production run. Several of the associates at CWAM fly or own Sport Cruisers and enjoy telling the story of the connection between the old and the new. The pride and workmanship of the workers was evident in the L-29's and 39's we fly as well as the Sport Cruisers today. Three generations of Czech aircraft are shown together here.